W. W. Norton & Company, 9780393073713, 605pp. Frederick Douglass recalled that slaves living along Chesapeake Bay longingly viewed sailing ships as "freedom's swift-winged angels." In 1813 those angels appeared in the bay as British warships coming to punish the Americans for declaring war on the empire. Over many nights, hundreds of slaves paddled out to the warships seeking protection for their families from the ravages of slavery. The runaways pressured the British admirals into becoming liberators. As guides, pilots, sailors, and marines, the former slaves used their intimate knowledge of the countryside to transform the war. They enabled the British to escalate their onshore attacks and to capture and burn Washington, D.C. Tidewater masters had long dreaded their slaves as "an internal enemy." By mobilizing that enemy, the war ignited the deepest fears of Chesapeake slaveholders. It also alienated Virginians from a national government that had neglected their defense. Instead they turned south, their interests aligning more and more with their section. In 1820 Thomas Jefferson observed of sectionalism: "Like a firebell in the night it] awakened and filled me with terror. I considered it at once the knell of the union." The notes of alarm in Jefferson's comment speak of the fear aroused by the recent crisis over slavery in his home state. His vision of a cataclysm to come proved prescient. Jefferson's startling observation registered a turn in the nation's course, a pivot from the national purpose of the founding toward the threat of disunion. 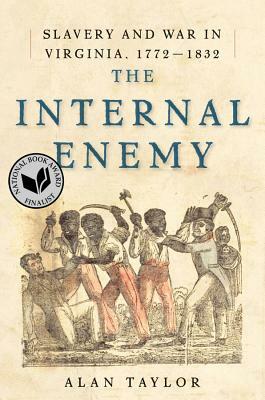 Drawn from new sources, Alan Taylor's riveting narrative re-creates the events that inspired black Virginians, haunted slaveholders, and set the nation on a new and dangerous course.